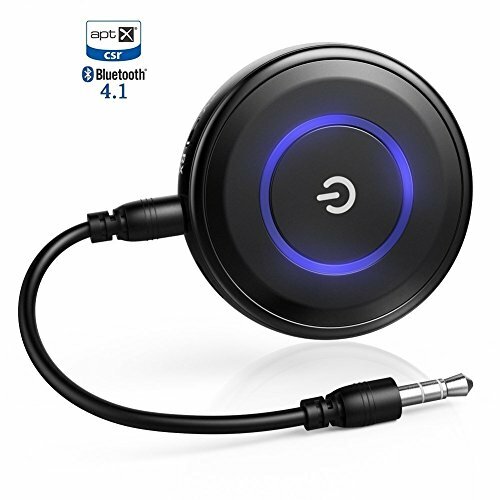 Whether you'd like to stream TV audio to wireless bluetooth headphones / speakers or make your old sound system wireless capable, the Giveet 2-in-1 Bluetooth Transmitter and Receiver is your best choice to meet all your needs. ◆ Latest Bluetooth 4.1 technology offer stable and reliable streaming wirelessly. ◆ Share great music with your partner by simultaneously pair and stream to two headphones/speakers at the same time. ◆ Giveet BTI-018 supports the codec of aptX Low Latency in Both TX & RX modes. It can effectively minimize audio latency to 40 milliseconds, and enables you to watch video while listening to wireless audio without noticeable lag. ◆ However, your BT headphones or speakers need to support aptX LL as well in order to achieve the best low latency performance. ◆ It is simple to pair your Bluetooth devices with a single button press and there are LED indicators to show different status. ◆ The adapter will automatically re-pair with paired devices. ◆ Never run out of power. The Bluetooth Adapter works while charging. Keep the Bluetooth Adapter always powered with any USB power adapter or connect to the USB port on TV. ◆ Magic Device as Bluetooth Transmitter: It can help transmitting stereo audio wirelessly from your non-Bluetooth audio sources such as TV, iPod, MP3/MP4, CD player, PC, eBook reader to your Bluetooth-enabled headphones, speaker or receiver. This way, you can enjoy high quality music or late night shows without disturbing your loved ones while they sleep. ◆ Magic Device as Bluetooth Receiver: Simply connect it with your wired headphones, speaker or car stereo via 3.5mm cable, and pair it with Bluetooth-enabled audio sources such as your smartphone, tablet to enjoy pure Hi-Fi music wirelessly. ◆ apt-X Low Latency & apt-X : With aptX, you can enjoy CD-quality sound wirelessly over Bluetooth connections with aptX-source devices like TV's, phones or tablets; with aptX Low Latency, you can now watch video while listening to wireless audio without any noticeable audio delay. Both TX/RX modes have been added with aptX Low Latency & aptX. ◆ Multipoint Design: When used as a Bluetooth transmitter, it can stream audio to two Bluetooth Headphones or speakers simultaneously. As a Bluetooth receiver, it can still be paired to two of your smartphones or tablets, but can only receive the audio from one of the two paired devices. Note: aptX does NOT support Dual link mode. ◆ Extra Long Working Time: Comes with outstanding 280mAh rechargeable battery; one single charge can last up to 14 hours. It also supports working while charging; you can plug in or unplug the external USB power charger any time you want. 100% Customer Satisfaction Guarantee: Love it Or Your Money Back without any reason within 30days, Full One Year Quality Warranty! If you have any questions about this product by Giveet, contact us by completing and submitting the form below. If you are looking for a specif part number, please include it with your message.